Home General Cute Animal Life: Jungle scene completed! welcome back to the Biondoo Devlog! It’s been a busy week and there was much to do, so progress wasn’t as fast as I thought. Still, the game progresses nicely as the third scene is completely finished by now. Why not have a look? What do you think? I hope you like it! 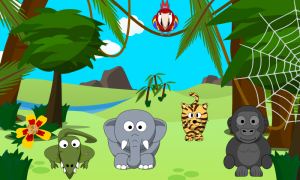 Of course there are some hidden animals and animations, but you have to find these yourself when the game goes live!